Community Overview: Aquarium Advice (AA) is one of the largest online fishkeeping communities on the internet.We host discussions on a broad range of topics including freshwater, brackish, and saltwater fishkeeping. Founded in 2002, Aquarium Advice boasts more then 49,000 members and is visited by more then 120,000 unique visitors each month. Our members are active fishkeeping hobbyists who are excited to learn about new products and vendors to help them manage and grow their freshwater & saltwater aquaria. Our most popular feature is our huge forum/message board. We also offer a large photo gallery with over 12,800 photos, a product review system, and a knowledge base system which includes profiles for many fish and plant species. Each day about 80 new hobbyists join our community presenting an excellent opportunity to get your products in front of new potential customers. The community is moderated by a team of expert fishkeeping hobbyists who make sure all discussions remain respectful and follow our community rules. We pride ourselves on being a quality forum community where no questionable content is allowed (your brand is safe with us). We also have strict rules that protect our sponsors by not allowing other businesses (that are not sponsoring our site) to post sales and links to their site. 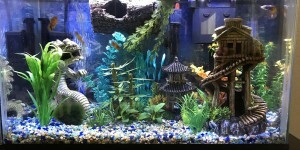 You can view all our traffic statistics at any time on our Aquarium Advice Quantcast profile. Automated Posting of Specials/Deals (if Sponsor provides via RSS). To get started just click here and fill in the form telling us about your company or services offered. We will then contact you with more information on how we can create a win-win relationship together.